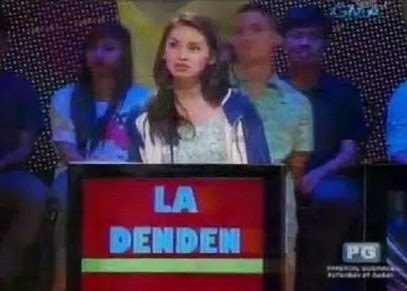 Denden Lazaro and her Boyfriend LA Revilla's TV Apperance on Celebrity Bluff Photos Here! TV Scoop: A power couple from 2 rival schools, Ateneo de Manila University's Denden Lazaro and De La Salle University's LA Revilla got seen playing on channel 7's Saturday night show Celebrity Bluff. They look perfect together. There really is no animosity between ADMU and DLSU in this instance. Photos C/O Kyle Chezka Poknat's Property!